Trisha Baker is local artist living in Broken Hill and her work is displayed on the walls of various businesses throughout the city. She is primarily a 'folk' artist and paints decorative pieces on canvases as well as other objects (wardrobes and furniture). 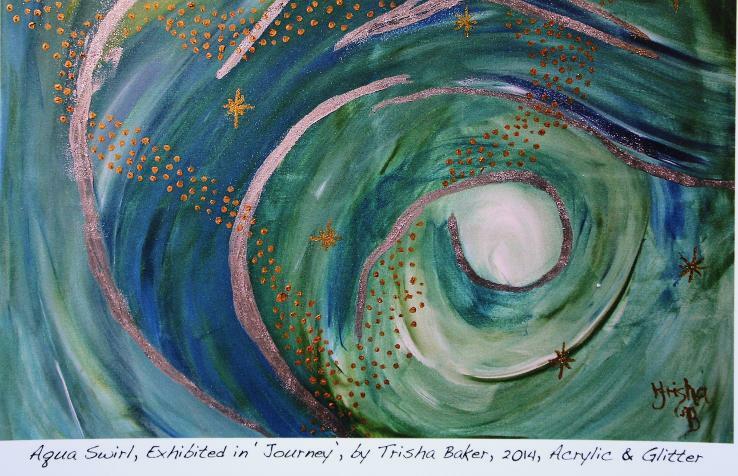 During her last exhibition, 'Journey' exhibited at STUDIO 3 Gallery, Broken Hill Art Exchange (2014) local primary school students from Alma Public wrote stories about her work for their comprehension class. Trisha's work is brightly coloured with motifs that are very appealing to young people and the broader community. The children aged up to 12 years of age wrote wonderful imaginative stories inspired by the images they saw, including spiralling and swirling shapes, castles in the sky, moons and trees sprinkled with glitter. The 'fairy-tale' quality to her work attracted many young art enthusiasts to the gallery.